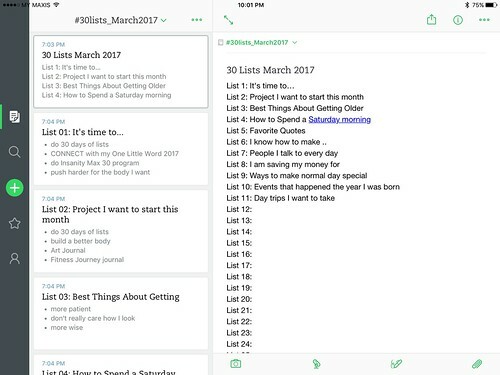 I decided that this month I want to participate in 30 days of List project for March 2017. I was a bit late joining the program. When March came I suddenly have many things on my plate. I wanted to make the lists in a physical book, do some decoration and then write my lists. I was stuck in the decoration department and with the list. Today I decided to do my list in my Evernote notebook. I made a notebook called #30lists_March2017 and then I created twelve notes in them. This first note is going to be like an index for the whole lists for easy viewing and navigation. I decided for the time being I am just going to focus on the lists only. I will eventually will finished with the hardcopy notebook but I am not going to make it a priority this month. I will only work on in when I feel like it. List 6: I know how to make .. The best thing about this project is there's no wrong way of doing the lists. It can be how ever you want. This is a snippet of your life right this moment. Four or five years from now, the things that will make in this lists might not be the same at all.